Now I get it! Now I get why people crochet. 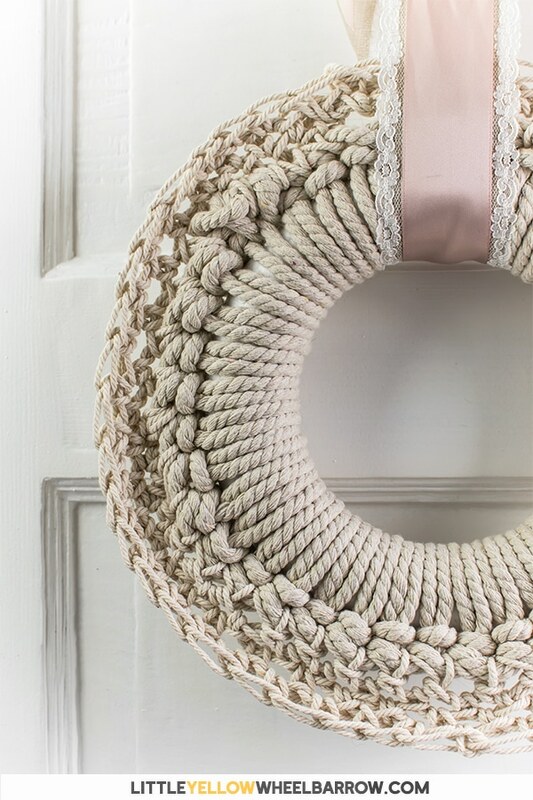 You can make things like this cozy crochet wreath in no time flat. Plus, as a beginner, you can appear to have some mad skills! For the record, I do not have mad crochet skills. No, no actually my crochet skills do not go past making a chain, or single crocheting, but that doesn’t matter. I am still crocheting my little heart out. Earlier this week I attempted these sweet little crochet coasters and loved the results. Since then I have been trying to find ways to use up some of the other macrame cordings I had laying around. 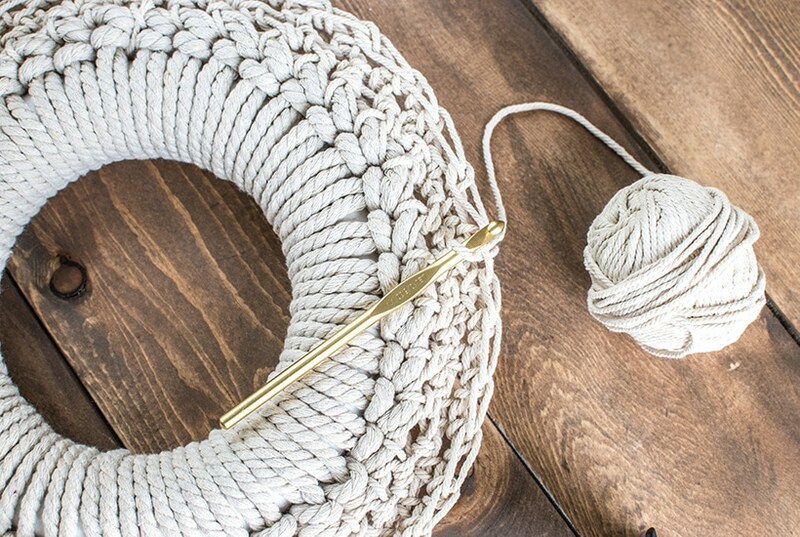 An Easy Cotton Wreath you Can Crochet in an Afternoon. I feel like I am cheating a little bit with this post because the process is almost the same as the coasters, just on a larger scale. There are a few fiddly bits, and they do come together a tiny bit differently, but for the most part, it’s the same process. A completely different look of course, but same process. I still wanted to share the post because I wanted to show that even with the tiniest bit of crochet knowledge you can make stuff. I had no pattern, I just winged it, and I was pretty impressed with the outcome. I’ve seen these wreaths before, so this is not an original idea at all, but my pattern is for those of us who don’t want to delve into the world of making lace or spending too much time with finicky bits. If you’ve been around the blog before, you know, I like to make pretty stuff quickly and cheaply. This project absolutely fits those parameters. I used macrame cording in 2 different sizes. The larger 6mm cording gave the wreath that chunky knitted look, which I love. I also added a border in 3mm cording because I wanted the crochet wreath to have a bit of dimension and felt that the two different sizes of cording would work. It almost looks knotted like macrame, but it’s all single crochet! 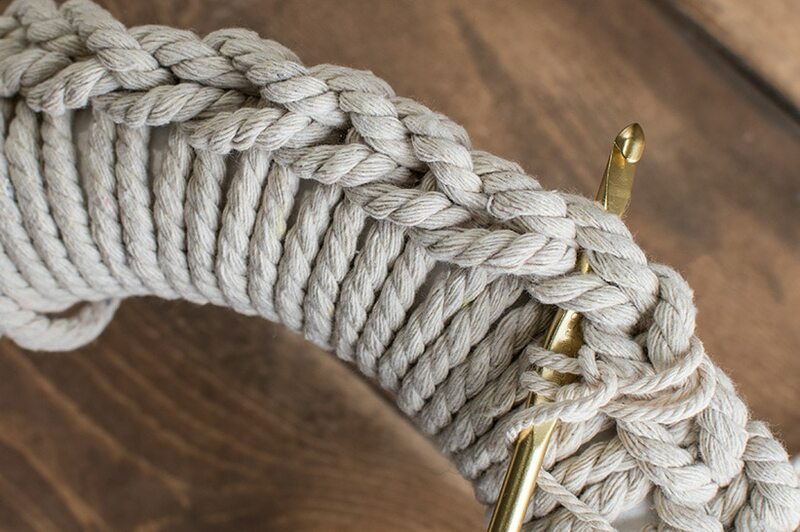 The cording is 100% cotton which gives it a bit of a natural feel and has a creamy beige tint to it. In some photos, it leans a bit pink but it only really shows that pink tone against a white background. I find this funny because I made another wreath for the holidays where I felt the yarn was beige, but when I made the wreath it was a blush pink. 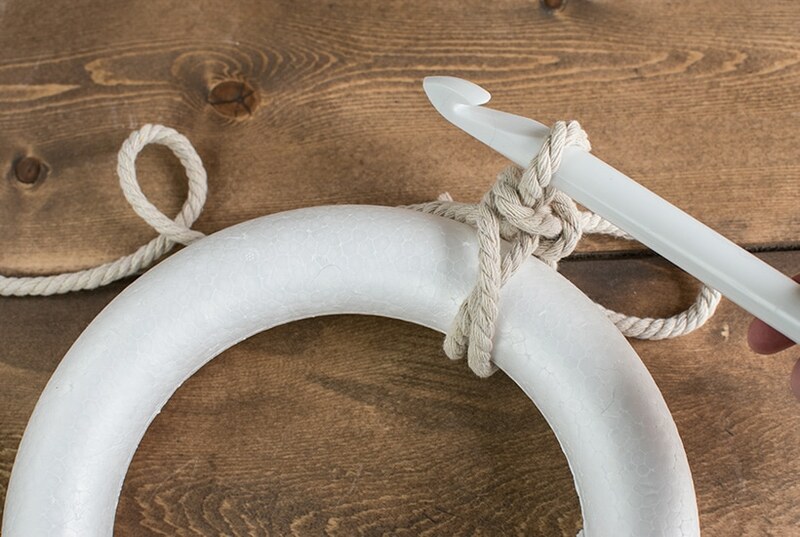 Make a slip knot with your 6mm cording around a size 50 crochet hook. 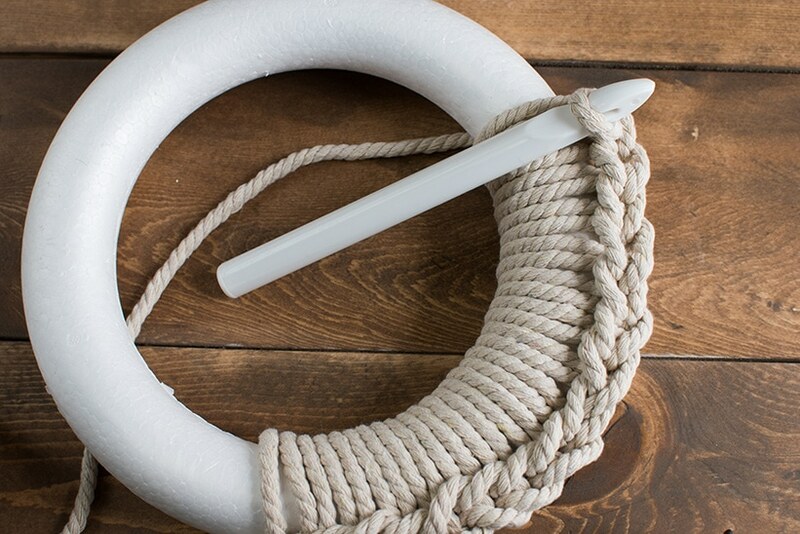 Lay the 6mm cording behind your 12-inch foam wreath form as shown in the picture below. Grab the 6mm cording through the center of the wreath form as shown in the photo. 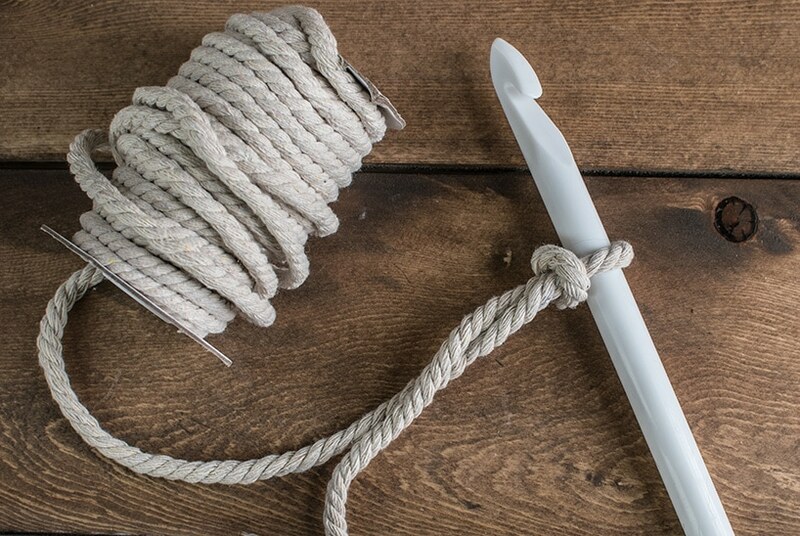 Your crochet hook should have two loops. The first loop from the slip knot and the second loop you just created by pulling the cording through the center of the form. 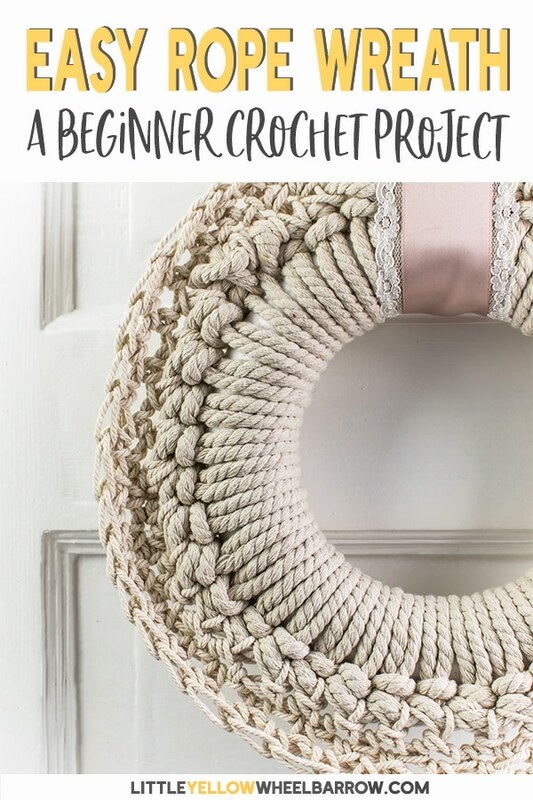 Use your crochet hook and grab the cording from behind the wreath and pull it through the first two loops. Tighten it a bit making sure the loop isn’t too loose. 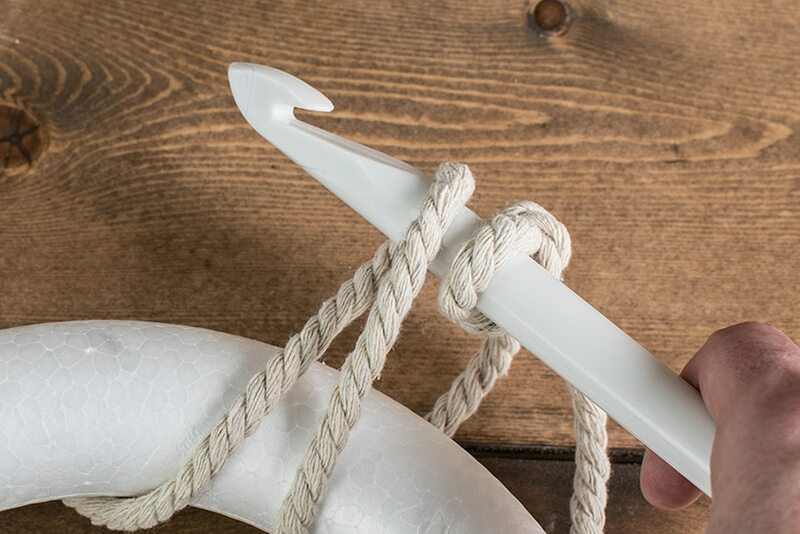 You will create a single loop on your crochet hook that looks like the loop in the photo. Make sure to push your cording to the back of the wreath frame before you pull it through the center. 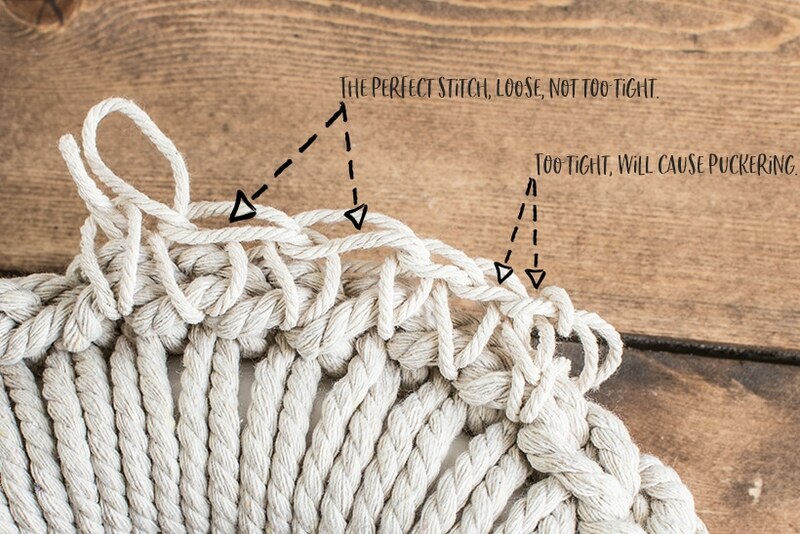 If your cording gets twisted as it did in the photo, it is very easy to straighten out. Continue this way stitching your cording to your wreath form. As you continue crocheting around your wreath your cording will form a chain on the outside of the wreath form. Keep adding loops. You want to make sure your crochet wreath is filled tightly with your crochet loops. In the wreath that I made, I could have added a few more loops! I didn’t realize until I was taking photos that some white of the wreath peeks through, I could have avoided that by just adding more loops around the form. Careful you don’t add too many. If you add too many your cording will not sit straight inside of the wreath form. When you reach your first full loop with the 6mm cording, snip off the end and weave it through the back of the wreath to keep it in place. Now you will start again, but this time you will be single crocheting your smaller 3mm rope cording into the larger chain. Crocheting into the large chain isn’t tricky, but it does require a bit of patience. As you push your crochet needle through the cording and pull back during your single crochet, you may snag some of the rope fibers. If you do, push back, release the rope fibers and continue. Now when you single crochet your outer rim with the 3mm cording, you want to keep it nice and loose. If you crochet all your loops too tight the wreath will not be round, and it will pucker. That puckering will cause the wreath to want to curl inward. We don’t want this. We want to make sure that the outer rim sits flat and looks like open knots. You can see in the photo below that the loops are quite large and open – these are the loops we want to have for our wreath. It looks a little awkward while you are crocheting, but the thin large open loops are what gives the whole wreath its look. Do two full loops all the way around your crochet wreath making sure to keep your single crochets very loose. Once you get the last crochet on your last loop, snip the end and push the end through the last loop and tighten, and weave the end into the back of the wreath where you will not see it. I tried going another round to make the wreath a bit beefier, but that third set gets a bit floppy and that was not the look I was going for, so I stopped at two full loops with the 3mm cording. 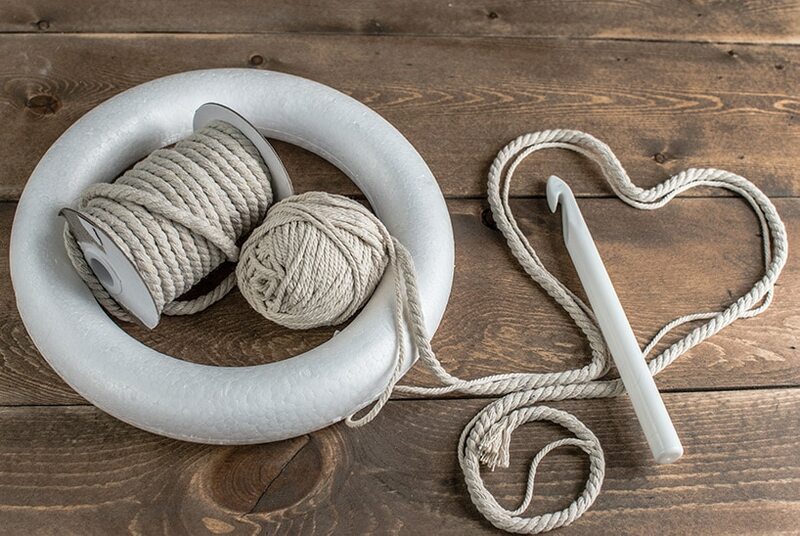 Weave in any remaining ends, trim any errant threads, and add a pretty bow or a wreath hanger. 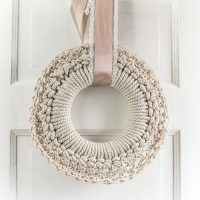 Your crochet wreath may take a bit of primping to get it to perfectly round, keep tugging and straightening, and eventually it sorts itself out. For such a simple stitch, with no fuss, and no special stitches it still creates a wreath that is quite pretty. 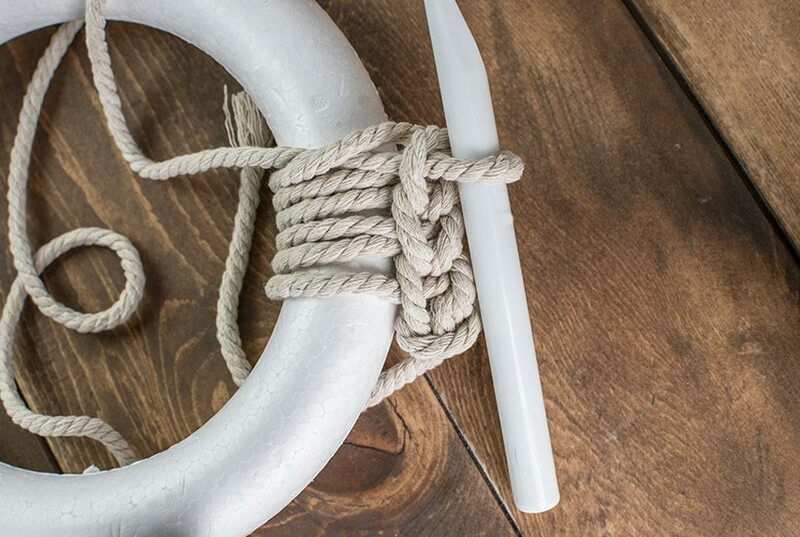 The combination of thick rope and thin does add a bit more texture and gives the whole thing a bit of interest. The cording works exceptionally well for this project. Macrame cording is a bit stiffer than yarn and creates edges that are sturdy and not floppy. 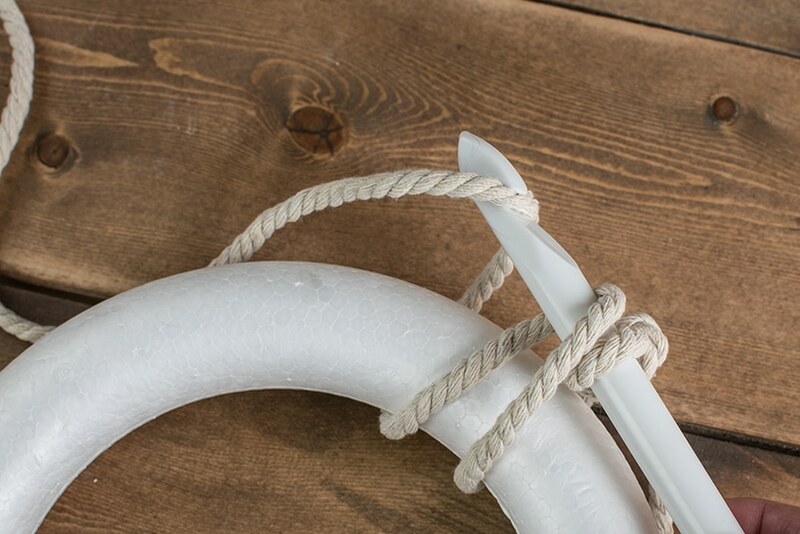 It also has a very clean look because the rope does not fray. Now I said the same thing with crochet coasters, but it makes sense to say it again. Because this cording is 100% cotton, it can be dyed. You could make this wreath any colour you wanted. You can find the cotton cording in different colours. The challenge is finding the same colour in both the 6mm and the 3mm cording. 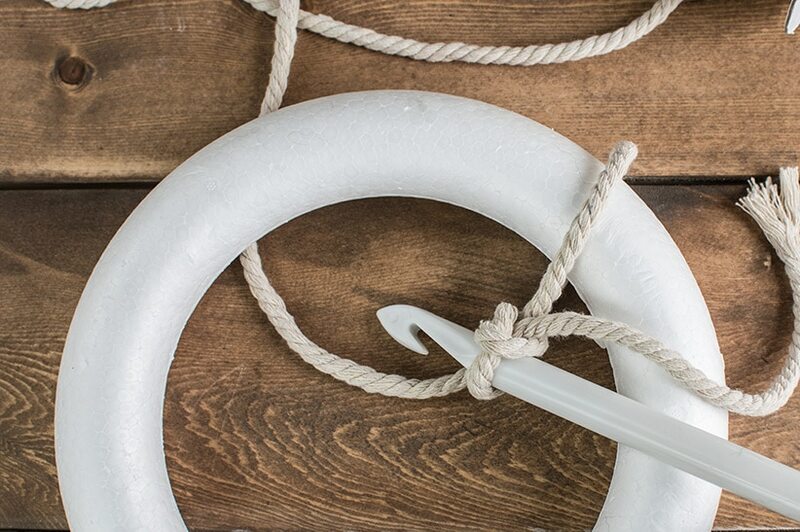 Dying the cording is an option if you are not into creamy beiges and neutral colours. This wreath is only 12 inches; the picture makes it look larger. You can make your crochet wreath larger, just make sure you have enough cotton cording. Make this beautiful crochet wreath in no time flat. 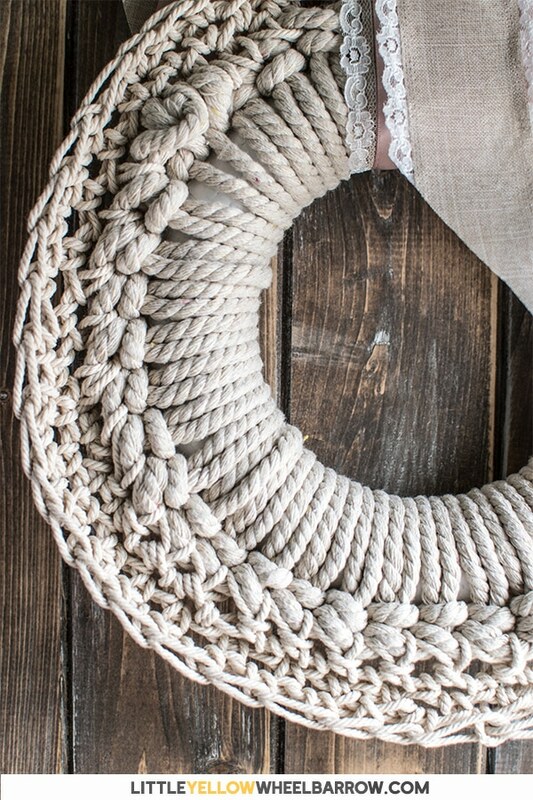 Cotton macrame cording adds lots of texture and a natural feel. Use your crochet hook and grab the cording from behind the wreath and pull it through the first two loops. Tighten it a bit making sure the loop isn't too loose. Keep adding loops. You want to make sure your crochet wreath is filled tightly with your crochet loops. Careful you don't add too many. If you add too many your cording will not sit straight inside of the wreath form. Now you will start again, but this time you will be single crocheting your smaller 3mm rope cording into the larger chain. Now when you single crochet your outer rim with the 3mm cording, you want to keep it nice and loose. 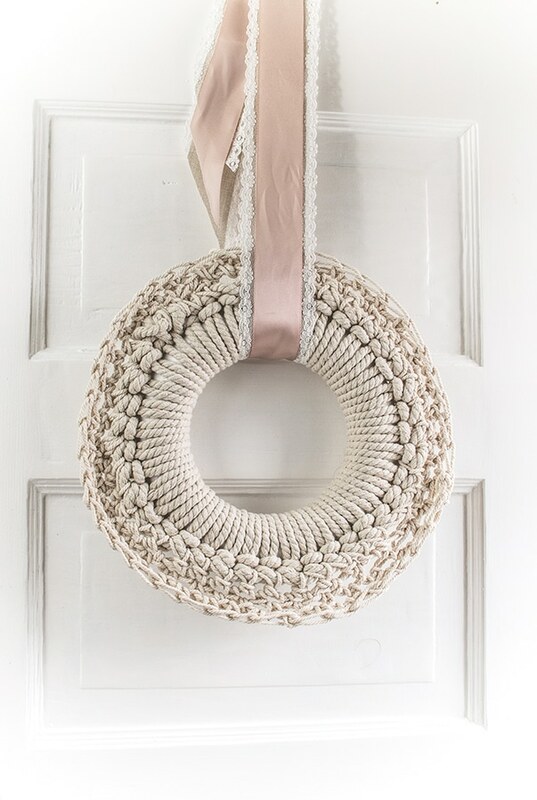 Crochet 2 full loops around your wreath with the 3mm cording. Weave in any ends and snip any errant threads. Your wreath will require a bit of tugging and pulling to get it to shape up the way you want. It took me a few minutes to get it aligned the way I wanted. It's important that you do not crochet too tightly with your 3mm cotton cording. Leave the loops nice and loose so the wreath will lay flat. Crochet Lens Protectors – Made with T-shirt yarn they are shock absorbent and lint free. You tutorial looks great and I am sure if I had some basic crochet skills it’d make more sense to me! Ha! Gosh, what a beautiful and unique wreath. I love the neutral color and texture from the yarn. You’re so sweet Carrie, thanks so much. But I swear, it is the easiest thing in the world to make and all I have are very very basic crochet skills. Thanks for stopping by! I love how your wreath came out! It’s great you could make it with just beginner crochet skills. I still don’t know how to crochet! Hiya Lauren, I don’t know how to crochet either! I’m a one stitch wonder. 🙂 Thank you for the sweet comment. It’s just splendiferious! I so want one…and I agree, I really like the two sizes to add dimenstion! Pinning! Wow! How much more crazy amazing can you get?! Love this.. and, of course, pinning! 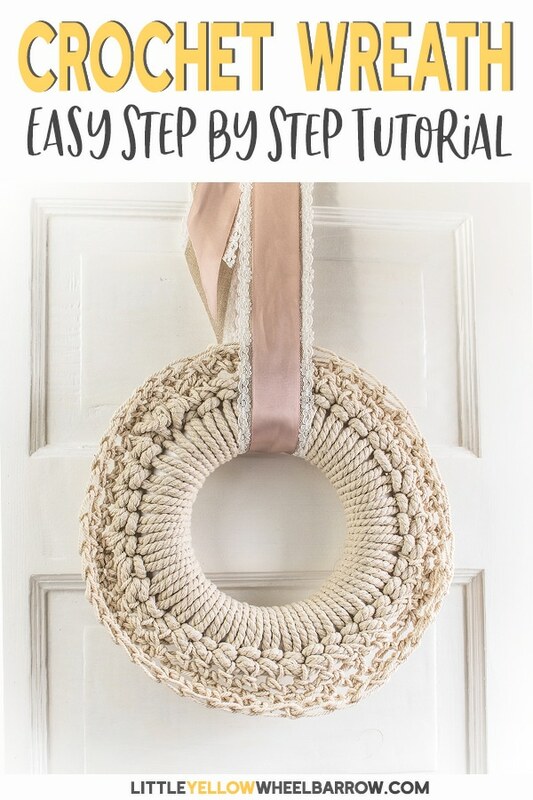 Love that your have easy to follow tutorials that show step-by-step how to create this warm inviting wreath! Lol, I make my husband test my instructions, he’s such a sweetie. He’s not the greatest crocheter in the world, but he figured it out and fixed a lot of the instructions along the way. Thanks for the comment Julie, and the pin!